Vitamins A, C, D and K are all essential for the formation of strong teeth and bones in children, and to keep teeth and bones healthy in adults. Because of the effect on the development of teeth and bones in the unborn baby, it is important that pregnant women take in the right levels of vitamin A, C, D and K – but consult a doctor, nurse or pharmacist before taking supplements when pregnant. Vitamin A helps the growth of teeth and bones in babies and children. 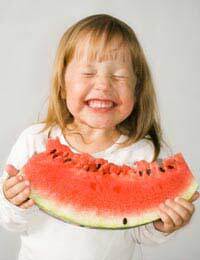 Low levels of vitamin A in babies and children can mean that the enamel on the teeth does not form correctly. Vitamin A is a fat-soluble vitamin, so it is stored in the body, in the liver and body fat. Vitamin A is found in oily fish, liver, eggs, and vegetables including carrots, sweet potatoes, broccoli and spinach. Vitamin C is important for the development of collagen, which makes up the tissues that connect bones together, and it also helps the deposition of calcium and phosphate in the bones. Lack of vitamin C can lead to scurvy. Symptoms include bleeding gums and in severe cases, the teeth can fall out. The bones can also become weak and brittle. A regular intake of vitamin C reduces the risk of periodontal (gum) disease. Vitamin C is a water-soluble vitamin, so is not stored in the body and must be taken in every day. Good sources of vitamin C include fresh fruit and vegetables. Vitamin D controls the levels of calcium in the blood, so is important for the formation and health of teeth and bones, both of which are high in calcium. Not getting enough vitamin D can mean that children’s teeth appear late, because the vitamin helps the milk and adult teeth to form. They can also develop osteomalacia (known in children as rickets), which means that their bones are soft, do not grow properly, and can become deformed, including the bones in the skull. Adults who do not have enough vitamin D may get also develop osteomalacia, with symptoms including bone pain, and bone weakness and bending, and may be vulnerable to fractures, including in the spine. A lack of vitamin D can also lead to softening of the teeth, and increase the risk of periodontal disease. Vitamin D is a fat-soluble vitamin, and is the only vitamin that is made in the human body, from the action of sun on the skin. Food can also be a good source of vitamin D, such as oily fish, eggs and dairy products, liver, mushrooms and fortified foods, including cereals, and some bread, milk and juices. People with a deficiency in vitamin K may develop brittle bones. Though vitamin K doesn’t seem to increase bone mass, it does seem to protect postmenopausal women with osteopaenia (bone loss that is a precursor to osteoporosis) from hip, spine and other fractures. Vitamin K is a fat-soluble vitamin found in green leafy vegetables. It is also often added to fortified breakfast cereals. Do You Need More Vitamins When You Are Ill? Vitamin E Rich Diet: Reduce Risk of Alzheimer's? Can Vitamin D Prevent Dementia?